Gurugram: The Festival opened to a very enthusiastic audience, with roster of 30 plus films from across the globe. The festival’s lineup of films is curated into several sections, based on its theme “Celebrating Life”. The films ranged from topics related to science, performance art, design, domestic politics, family, activism, true crime, and social issues. The festival would help boost creativity among children. During the event, eminent guests and directors from different parts of the world shared their experiences. Renowned film maker Ms Arunaraje Patil of Masoom movie fame was the Chief Guest for the event. Eminent filmmakers and industry stalwarts were part of the jury, to name a few Ms.Arunaraje Patil – Renowned Film Director and Editor, Reena Mohan- Renowned Film Maker, Sanjeev Sood- Renowned Film Maker, Himanshu Malhothra- Renowned Film Maker, Dr. Sabina Kidwai- Associate Professor AJK MCRC, and Gautam Pandey- Documentary Filmmaker and Wildlife Photographer. With more than 200 submissions, film festival announced the winners from a slate of 22 finalists in the grand finale event. The competition was stiff as the entries were amazingly crafted. The winners for the Photography competition are Ist Prize- Nainika Gupta, Lotus Valley International School, 2nd Prize- Akshat Atal, GD Goenka Public School, Siliguri, IIIrd Prize, Kashkey Sundaram, GD Goenka Wordl School, ans a special jury prize by NDTV to Gurkeerat Singh, Indraprastha International School. The winners for the Film competition are Best Fiction Film, Safar to Shashank Virag, Best Documentary Marriage Bazar directed by Vijay Kumar, and Real men for Best PSA by Aishwarya Khanna. In its first edition Fotographia is set to become a platform dedicated to discovering emerging and unknown talents at high school and university levels from around the world. With a view to provide meaningful encouragement and inspiration to the participants, the fest will include a Photography competition for high school level across the nation, followed by work of films and documentaries invited from students from various national and international colleges and universities. 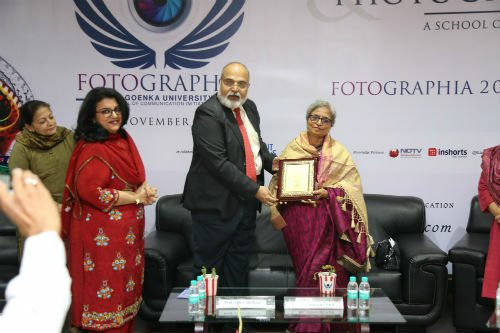 With such a stellar programme, Fotographia 2017 promises to provide a unique and captivating cinematic experience every year against the backdrop of the beautiful Aravalli Range at the GD Goenka University campus with great support from our sponsors Greenply Industries Ltd, Indian Oil Corporations, Nescafe, Nikon, CaPF, NDTV, Inshrots, Embassy of France, Institut Français, Little Red Car Production House, Hub Hopper, Petal Soft, and SIRBI Indane Distributors.